Want to find products that will make your life more convenient or enjoyable? Investigate the whatchamawhosit that you hope will change your life. Ever have one of those days? You know, the "Momma said there'd be days like this" days. In fact, it feels like Momma, Daddy, Sister and Brother said "there'd be days like this" days. During these times, there are a few go to solutions once you slunk your way home to make yourself feel more like your happier self again. If you are my husband, he suggests, "Hey, let's go to the gym." In my head, I know, of course, that this is a great course of action, but when he suggests things like this on a day like this, I have three typical reactions, laugh, roll my eyes, or throw my hands up in the air in a dramatic show of exasperation. Sometimes, his reminder reminds me that I am not only failing at life, but also at my fitness goals leads to all three. If you ask my mom, she suggests watching a good movie, going to bed early and perhaps a bit of prayer. Again, all of those things can provide relaxation and piece of mind, but they cut into productivity. Not the overachieving clean-your-whole-house kind, but the "Crap... We have three apples, some chia seeds, and a box of pasta. What in the world am I going to cook for dinner tonight?" times, where you have to get creative. So, sometimes, when all I want to do is just crawl in bed with work clothes on, put on a soothing nostalgic Winnie The Pooh from childhood, and zonk out, I can't. With all of that truly helpful but not-applicable advice, what is a girl to do? Some of you are thinking... "Wine, Chocolate, Ice cream.... Duh!" I hear you all, and I have indulged in my fair share of all three. Believe me, a margarita with chips and guac have consoled me on plenty of occasions. But, ever since I was a kid, there is one super simple fix to a bad mood. And, thankfully, it is not a mountain of pancakes, chocolate, or cookies. It was apple juice! Yes, I might be crazy, and your thinking, "Um, chocolate is scientifically proven to make you happier--not apple juice." And yes, you are so right, but there is something both soothing, nostalgic, and cleansing about freshly made apple juice. Come to think of it, those all match the same qualities of fitness, rest, and meditation. Wow, apple juice really does rock my world. Alrighty, on to the review, which was inspired by this apple juice. We got our Breville Juicer as a wedding present about three years ago. Thus far, it has worked like a dream, and we have had little to no mechanical problems or breakage. However, if I am being completely truthful, the last year has been a bit of a hiatus from juicing. If you are familiar with juicing, then you will know that it is simple, but the clean-up can be a bit off-putting. This particular model, I mostly hand wash, but we have run it through the dishwasher a few times, and the pieces have been fine. I just do not put the blade/mesh part through the dishwasher. The juicer does come with a scrubby brush, which helps expedite cleaning and keep you hands off the sharp blades. 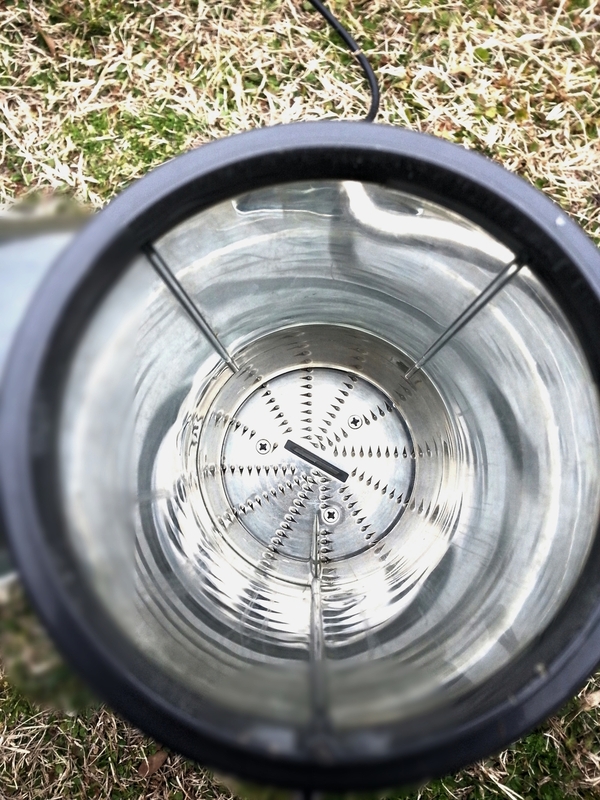 This model is centrifugal, which means that the produce is not slowly pressed but cut and spun quickly through a mesh filter. However, this faster juicing method does oxidize the produce, so making big batches of juice to store in the fridge is not ideal. If your plan is to juice and drink right away, then this is not really an issue for you. In regards to what this juicer produces, the juices are always delicious and rarely do I have issues getting produce through. Only once did I have some difficulty with a beet. It actually caused the machine to over-heat, so when I juiced beets in the future, I just cut it up into smaller pieces. This, unfortunately is true of most of the produce I juice. I would love a "just-throw-it -n-whole" juicer, but this model seems to do much better with smaller chunks. While the company says that the three inch opening is adequate to fit a whole apple, I find that the apple's skin gets stuck on the sides and it is really tough to push through. I certainly do not have to do a fine chop, but I do need to cut the apple into quarters for the easiest juicing. The juicer's pitcher can hold up to 1 liter, but sometimes I find this is too small when I make a lot of juice for both my husband and myself. When we drink juice, we drink A LOT, so occasionally, I just put a cup under it, and pour the juice into a larger pitcher. 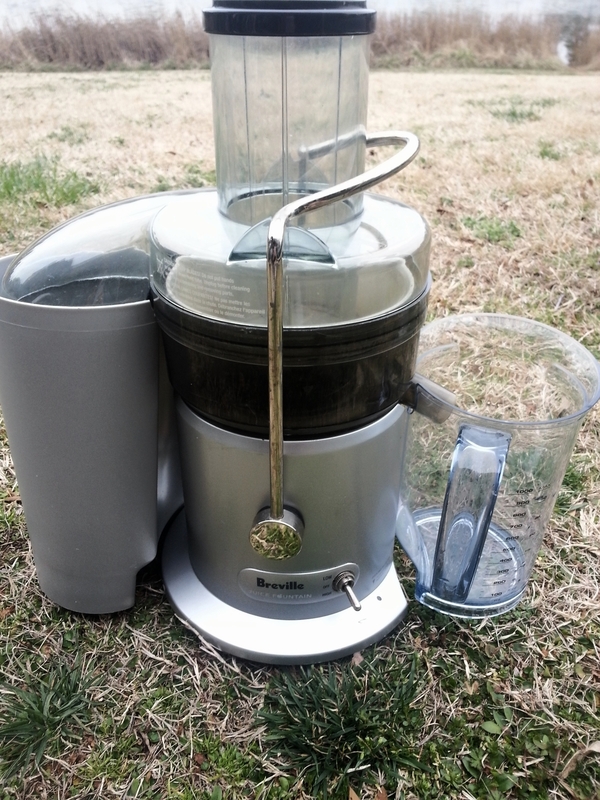 As of right now, the Breville Juicer Fountain Plus will cost you about 150 dollars. This is a decent price considering it's newer brother runs at about 400 dollars, so if you are in the market for a budget-friendly centrifugal juicer, then the Breville is a good place to start. It is very user friendly, locks (so you won't have celery and apple pulp on your walls), and rarely has mechanical problems. We have greatly enjoyed our juicer, and I can truthfully say that regardless if I am having an incredible day, mediocre day, or a day straight from Satan's nether regions, juicing makes it better. So, if you want to hop on the green juice band wagon, or you want to give my apple juice remedy a try, then perhaps consider giving the Breville a whirl. What is you favorite bad day fix? Is it also a juice, if so, what juice makes the quality of your day improve?